Go Green Campaign Ride towards Chamarajpet. - GGI-Group size: 4000+ Professionals, Increasing on day to day basis, Come & join us 2 serve Mother Nature. 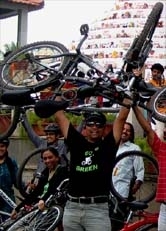 Go Green Campaign Ride towards Chamarajpet. 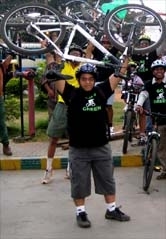 23 GGI's Participated on 21 March 2010 Go Green Campaign Ride, Started from Jaynagar 5th Block RIC junction @ 6:45am and reached cubbon park by 7:30am.. We found other GGI members from other parts were already waiting for us @ the entrance Gate of cubbon park. As suggested in our earlier discussions this time we decided to go towards Chamrajpet. After our Group photograph we started off to Chamrajpet by :7:45am. and reached Chamrajpet Shankar Matt by :8:20am. 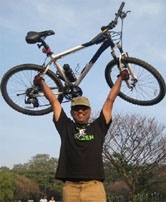 after bike salute we all dispersed..
Central Library - Hudson Circle - Town hall - KR-Market over flyover - towards Chamrajpet- Shankara Mutt Road - Shankar Mutt - Gandhi Bazar - NR Colony - Southend Circle - Jaynagar 3rd Block - Swiming Pool road - Jaynagar 4th block - KFC - Jaynagar 5th Blk Cofee day/ Apple Mac show room.